"The Shops at Yerba Buena"
The neigborhood is made up of a great cross section of businesses, both large and small. In addition, there is a small residential community that is served by the garage as well, mostly made up of middle income and senior housing. The Garage supports and is active in many community organizations, The Yerba Buena Alliance, The Yerba Buena Gardens Advisory Committee, BOMA and the Hotel Association to name a few. The bulk of the revenues generated by the garage are returned to SFMTA to support mass transit within the City. 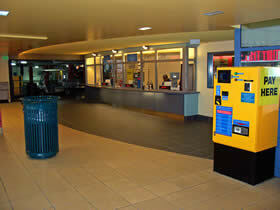 A relatively small portion of the garage's revenues are kept by the garage to help maintain and improve the facility. In addition, the garage supports worthwhile projects such as City Carshare, Zip Car, Getaround, and Scoot Networks. In conjunction with the City of San Francisco, the garage has installed 8 electrical charging stations. 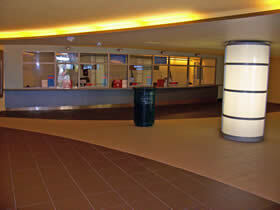 3 are located on the Ground Level next to the main entryways in our "Green Zone". 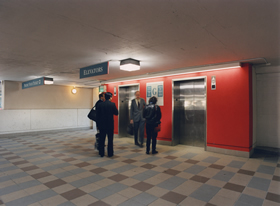 The other 5 are located in our Basement Level, which can be accessed through the Mission St. Entrance. Certain spaces in this facility are reserved for use by authorized, handicapped individuals. UNAUTHORIZED VEHICLES NOT DISPLAYING DISTINGUISHING LICENSE PLATES OR PLACARDS ISSUED TO PHYSICALLY HANDICAPPED PERSONS PARKED IN THE AREAS DESIGNATED FOR ACCESSIBLE PARKING WILL BE IN VIOLATION OF SECTION 22507.8 OF THE CALIFORNIA VEHICLE CODE AND WILL BE TOWED AT THE OWNERS EXPENSE. 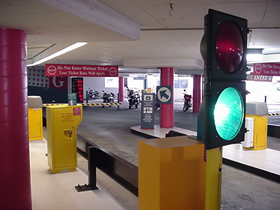 The garage has a total of 6 vehicle entry lanes. Three can be accessed at its main entry which is located on Mission Street approximately 300 ft. east of the intersection of 5th & Mission. Two additional entrances are located on Minna Street which runs one way from 5th Street to 4th Street. 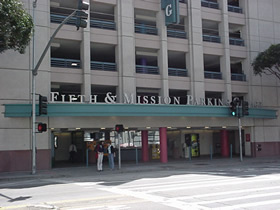 Monthly parkers may enter at any of the regular entrances and have one additional "Monthly Only" entry located about 3/4 of the way down Minna towards 4th Street.